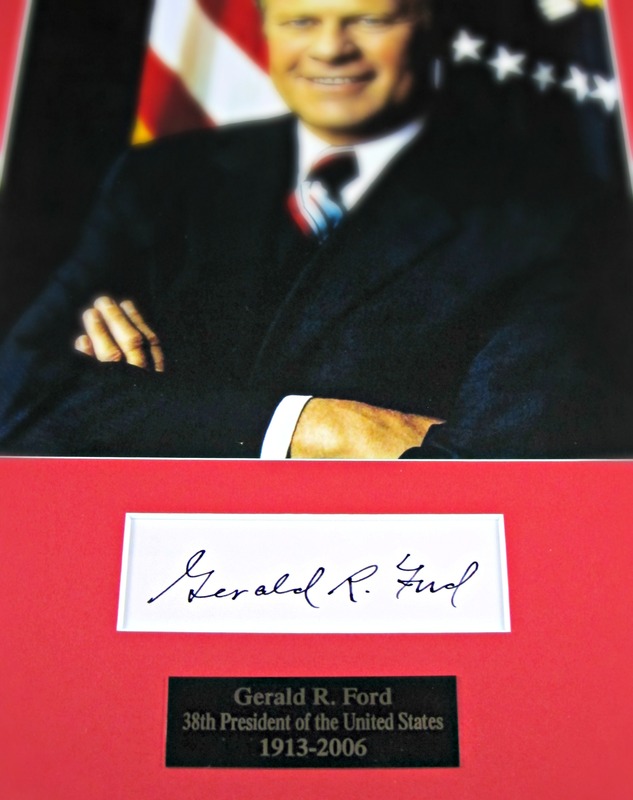 Cut signature and 8 x 10″ color photo of the 38th president of the United States of America. It comes museum-quality matted and framed. Includes Letter of authenticity from Memorabilia Center. 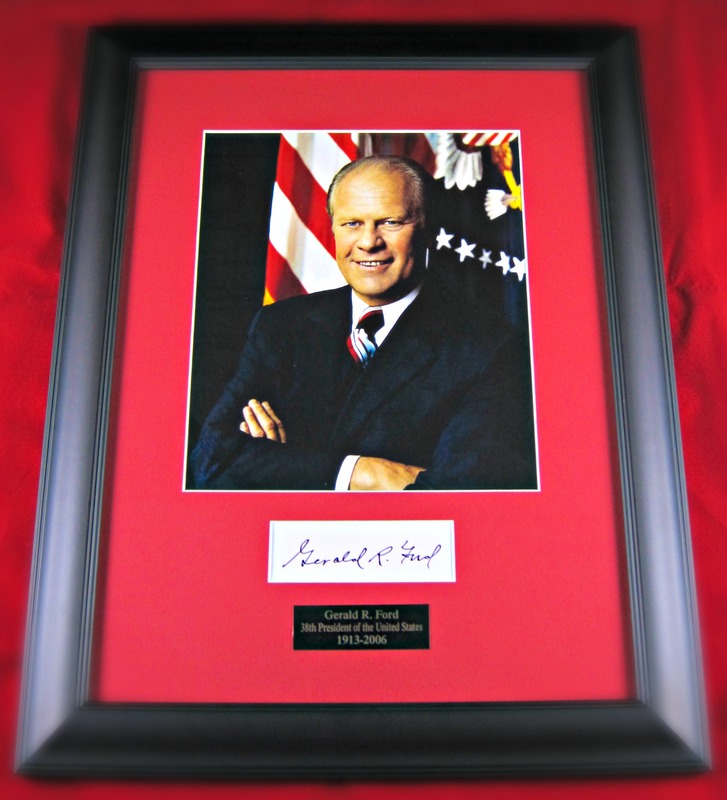 Gerald Rudolph Ford Jr. (born Leslie Lynch King Jr.; July 14, 1913 – December 26, 2006) was an American politician who served as the 38th President of the United States from August 1974 to January 1977, following the resignation of Richard Nixon. Prior to this, he served eight months as the 40th Vice President of the United States, following the resignation of Spiro Agnew. He was the first person appointed to the vice presidency under the terms of the 25th Amendment, and consequently the only person to have served as both vice president and president without being elected to either office. He is the most recent vice president to become president as a result of an intra-term vacancy in the office, and his 895 day-long presidency is the shortest in American history for any president who did not die in office. Before his appointment to the vice presidency, Ford served 25 years as U.S. Representative from Michigan’s 5th congressional district, the final nine of them as the House Minority Leader. As president, Ford signed the Helsinki Accords, marking a move toward détente in the Cold War. With the conquest of South Vietnam by North Vietnam nine months into his presidency, U.S. involvement in Vietnam essentially ended. Domestically, Ford presided over the worst economy in the four decades since the Great Depression, with growing inflation and a recession during his tenure. One of his most controversial acts was to grant a presidential pardon to President Richard Nixon for his role in the Watergate scandal. During Ford’s presidency, foreign policy was characterized in procedural terms by the increased role Congress began to play, and by the corresponding curb on the powers of the President. In the Republican presidential primary campaign of 1976, Ford defeated former California Governor Ronald Reagan for the Republican nomination. He narrowly lost the presidential election to the Democratic challenger, former Georgia Governor Jimmy Carter. Following his years as president, Ford remained active in the Republican Party. His moderate views on various social issues increasingly put him at odds with conservative members of the party in the 1990s and early 2000s. After experiencing a series of health problems, he died at home on December 26, 2006. At the time of his death, Ford—at the age of 93 years and 165 days—was the longest-lived of all U.S. presidents (a mark surpassed by George H. W. Bush on November 25, 2017).